In March 2014, members of our community in formation nominated more than 20 names for our parish. We held two votes: first, to reduce the list to three, then, second, to choose from the top three. We chose Saint Clare of Assisi. Bishop Robert Guglielmone then confirmed our choice. Our parish now had a name and a patroness! 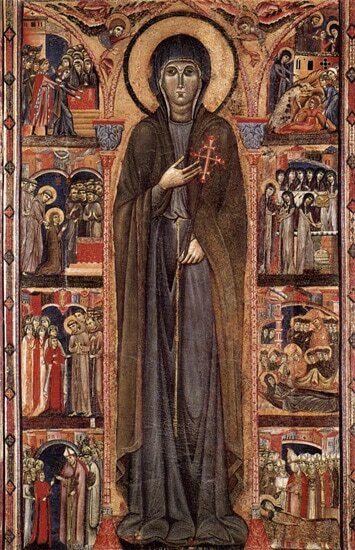 Saint Clare of Assisi was the thirteenth-century cofounder of the Order of Poor Ladies (or Clares) and perhaps the most famous protégé of Saint Francis of Assisi. She is renowned for her radical devotion to the ideal of evangelical poverty and Jesus Christ in the Blessed Sacrament. We strive to imitate her life of prayer, simplicity, and charity. Perhaps the best-known miracle attributed to Saint Clare is the defense of her monastery and the town of Assisi from an invading army. As soldiers scaled the walls of her monastery, she held aloft the Blessed Sacrament and prayed for God’s protection. Her adversaries immediately fell back as if stunned and broke off the attack. Because of her courageous trust in God, she is often depicted in religious art holding a ciborium (i.e. container for the Blessed Sacrament) and standing on a fortress wall as soldiers flee in terror. Learn more about Saint Clare of Assisi at New Advent Catholic Encyclopedia. 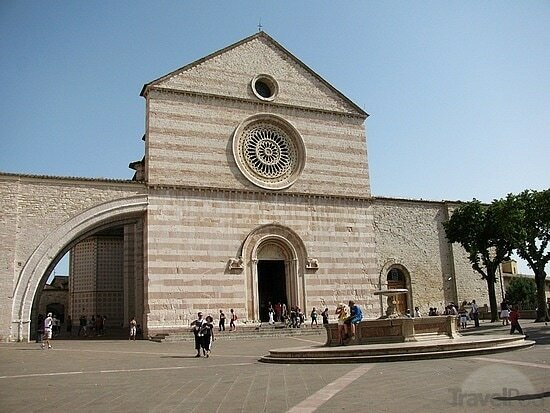 (Above) The Basilica of Saint Clare of Assisi, Italy. Construction began in 1257. (Left) Altar piece of Saint Clare of Assisi painted by an unknown artist, c. 1280, showing eight scenes from her life. The portrait has Clare in her Franciscan habit pointing to a small processional cross. We have a reproduction of this piece hanging on the wall in the Performing Arts Center where we celebrate Mass every week. The episodes are from Thomas of Celano's Life of St. Clare and read from bottom to top on the left and then from bottom to top on the right. The first episode is her reception of a palm from the bishop on Palm Sunday (Life 13-15); the second and third, her acceptance into the religious life (Life 14-17). The fourth is hard to identify. The top right image shows one of the many miracles gained through prayers with Clare's intercession. On the right are three episodes in the saint's death. In the first, the pope visits her deathbed (Life 65-66). In the second, the Blessed Virgin Mary and a host of virgin saints cover her body with a mantle (Life 71). The third shows her sisters carrying away her casket. (Left) The tomb of Saint Clare of Assisi in the crypt of the Basilica in Assisi. Her mortal remains lie beneath the wood and wax depiction.